Ninety seven per cent of exporters questioned in a survey said they were optimistic about growing their businesses through international trade. 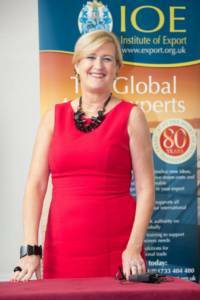 We spoke to Institute of Export & International Trade Director General Lesley Batchelor, OBE about the results. “This survey was prompted by the comments made in the press and government regarding the opportunities available upon leaving the EU. We asked where the optimism was and were pleased to see that although most businesses we spoke to would prefer the status quo, they are being realistic about the need to continue in business terms and look at new markets. “This is great news for the country and also for the Institute as we are increasingly convinced that to succeed in this new business environment, knowledge of how international trade operates is vital. It includes the legal aspects of contracts; insurance and IP; the financial issues around getting the price right and getting paid; how to comply with regulations and understand how trade works in terms of tariffs and rules of origin. This knowledge is going to be crucial to all businesses that trade across the world – even with our closest neighbours, with whom, traditionally, we have not had these issues. Spearheaded by the Institute of Export & International Trade – the UK’s only professional body offering recognised, formal qualifications in International Trade – the research involved responses from over 200 Institute members and the wider export community. Respondents were positive about future trade prospects despite fears of a growing US protectionist agenda, national elections across Europe potentially upsetting the status quo – and Britain’s possibly fractious divorce from the EU. While 93 per cent of those taking part were upbeat about exports to the EU, participants were moderately optimistic about opportunities with the US and cautious about trading with India, China and Russia. How did these results fare after both Brexit, and the US Elections? “The survey was conducted to gauge opinion post Brexit and following the US election. The world is constantly changing and the referendum and US poll have made a tremendous impact on international trade but it is all business and where businesses find a problem, they work around it and come up with another solution that allows them to continue. This is expected. Exporters surveyed remain concerned about Brexit – 87 per cent forecast it would result in a loss of trade and 40 per cent expressed uncertainty over negotiations and their outcome. The greatest optimism was for global trade and trade with the EU – with 93% of respondents saying they are still optimistic for export opportunities in the EU why do you think this is so? Nevertheless, over half of the respondents regarded extending their overseas markets as the single biggest opportunity for their company this year – with a 3:1 ratio looking to grow markets overseas and almost one third seeking to achieve this expansion in 2017. This confidence extended to investment – with nearly a fifth of businesses working in international trade planning to invest in their marketing spend and 15 per cent looking to develop new products. 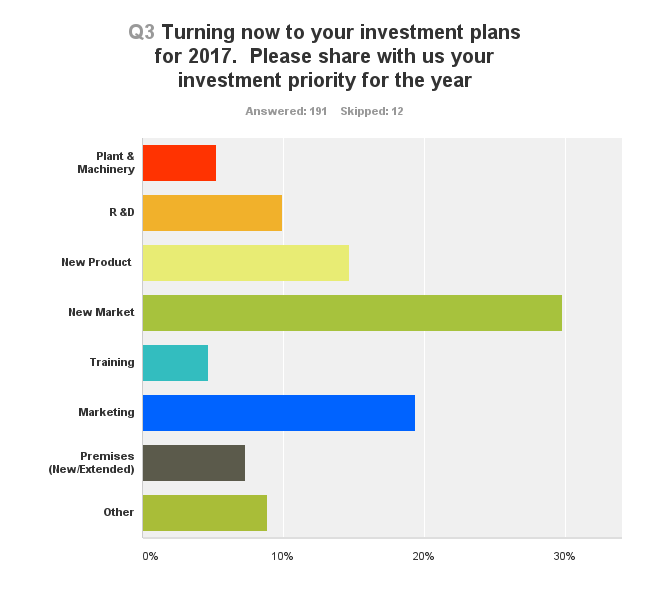 While 12% plan to invest in plant and/or machinery or extend their premises, just 5 per cent will invest in training. When examining further opportunities for 2017, 12% recognised the value of extending their offer with additional services to increase revenue. In your opinion, what are the biggest challenges companies will face when it comes to new market expansion and growth? 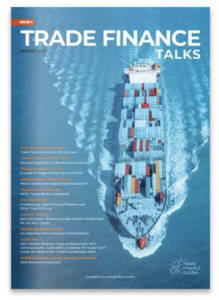 Read our article about trade finance and cybersecurity here. Institute Director General, Lesley Batchelor OBE, said: “The importance of businesses managing currency risk is a fundamental part of ensuring profitability when trading in international markets. 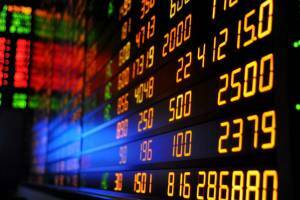 Do you trade overseas in different currencies? When trading abroad, currency volatility should be an important consideration for your business to mitigate external risk. We have a team of business currency experts that you can talk to, or, alternatively we have put together some extensive guides on currency options, forwards and risk management for those trading in different currencies. Joseph Brazier is an undergraduate at the School of Oriental and African Studies currently studying for a BA in Arabic & Hebrew. His interests primarily focus on the diplomatic effects and repercussions of economic policy in the Middle East and North Africa in the context of current interstate relations, soft power and security.